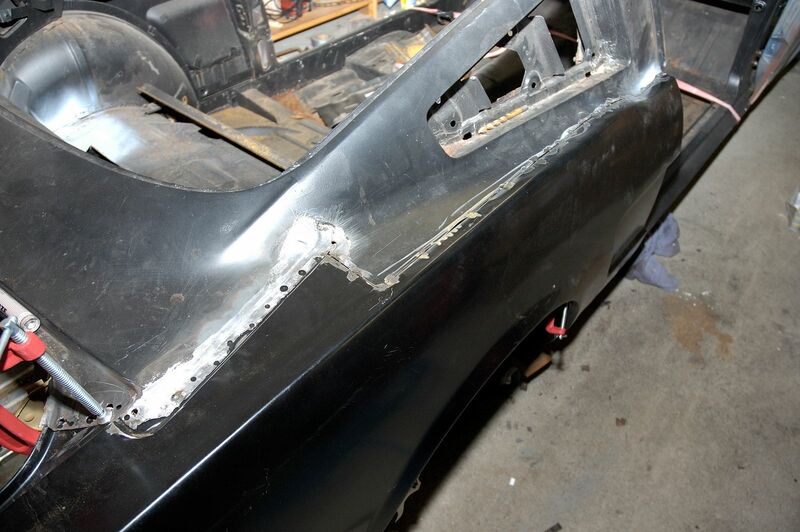 The quarter panels had a lot of dings, cut outs, and old attempted repairs. I had initially thought that I could use patch panels to fix them but I didn't like the idea of filling the joints and the patch panels didn't look right. I opted to replace the quarters with new repro metal. I would get a nice new surface too instead of the old nasty pitted one -- less body work. I started by melting the body lead with a torch. You should do this with plenty of ventilation and eye protection. Drilling holes in the bad quarter helped drain the liquid metal and break the factory tack welds. While the metal was still hot, I wiped the excess lead off with a damp rag. 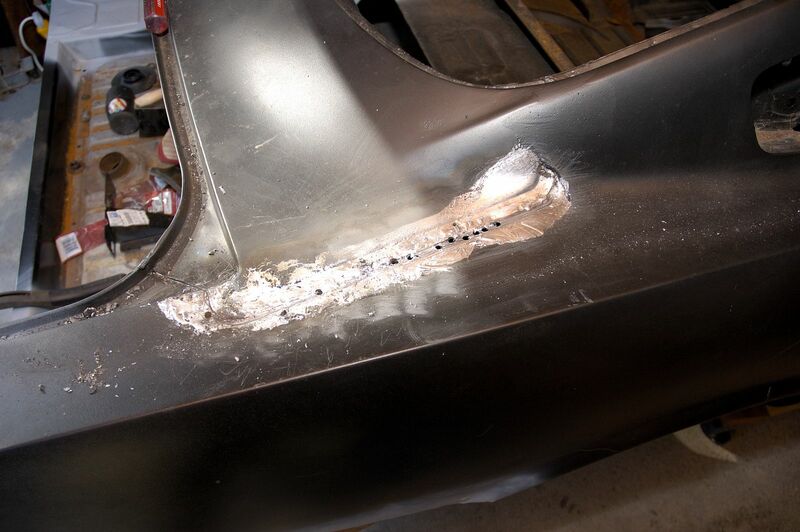 Then using a reciprocating saw to cut away the majority of the metal, leaving just small strips around the areas of the factory spot welds of the door jamb/pillar and wheel wells. 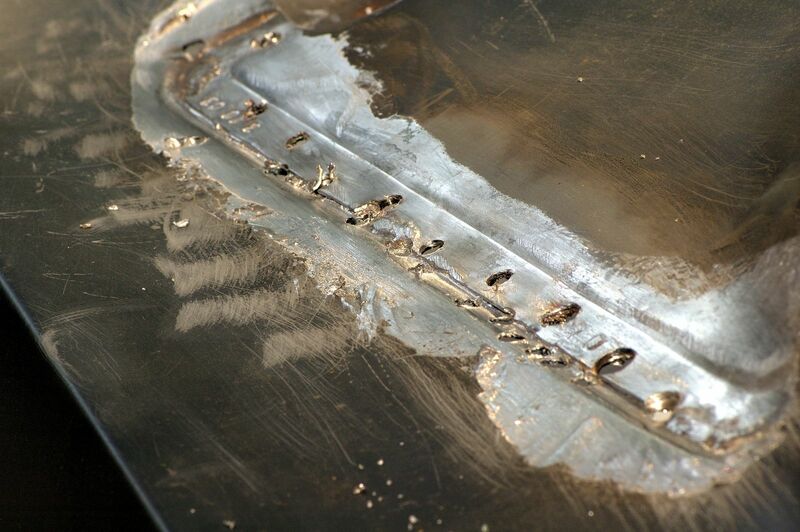 Its easier to pry off the small metal strips without disturbing the good metal that remains behind. After some cleanup and priming, I set the new quarter panel in place and clamped it to the old metal. Its really important to install the door to check alignment before welding the new metal. I did an alignment check before cutting out the old metal as well. The trunk lid and tail light panel should also be lined up, if not already installed.